From “Ring Masters” by Jody Duncan, Cinefex, issue 89, April 2002. 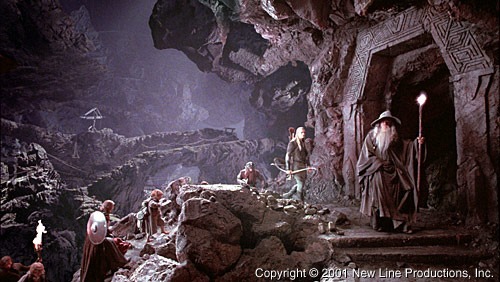 For wide views within the Mines of Moria – and in many other instances throughout the film – ‘little people’ scale doubles, often in masks or appliance makeups resembling the principal actors, stood in for the hobbit characters. A foreground mine interior set, built by production designer Grant Major, was extended into the distant background through miniatures. Both full-scale and miniature sets were designed to reflect the rough, angular, stone-based dwarf culture.